Contents: Clam chowder, two rolls, apple sauce, low fat milk, mystery item behind the soup (peaches perhaps). Oh God, I love those rolls so much! I am 34 now and I still long for those old school rolls. Yeah, they are amazing. 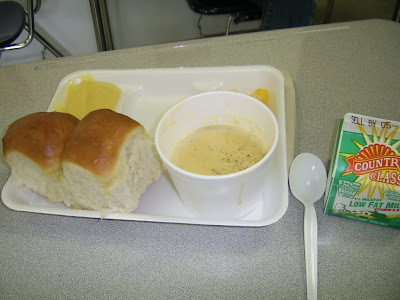 My high school had these massive cheese rolls that were the same kind of roll. They were great dipped in nacho cheese sauce.